Fat has been the source of controversy for nearly 90 years, dating back to the 1930s, when the rate of heart disease started to become a concern. Heart attacks, prior to the 1920s, were almost unheard of. Suspiciously, prior to the rise in heart disease, starting around the turn of the 20th century, fats such as butter, lard and tallow were being replaced with vegetable oils such as canola, corn, soy and safflower. After WWII, manufacturers such as Wesson Oil and Crisco began hydrogenating vegetable oils to make them solid at room temperature – such as vegetable shortening and margarine. Between 1900 and 1950, the use of margarine quadrupled, the use of vegetable oils tripled, and egg and butter consumption decreased by half. Was it any coincidence that there was a steep rise in heart disease from less than 10% of all deaths to 30% of all deaths? 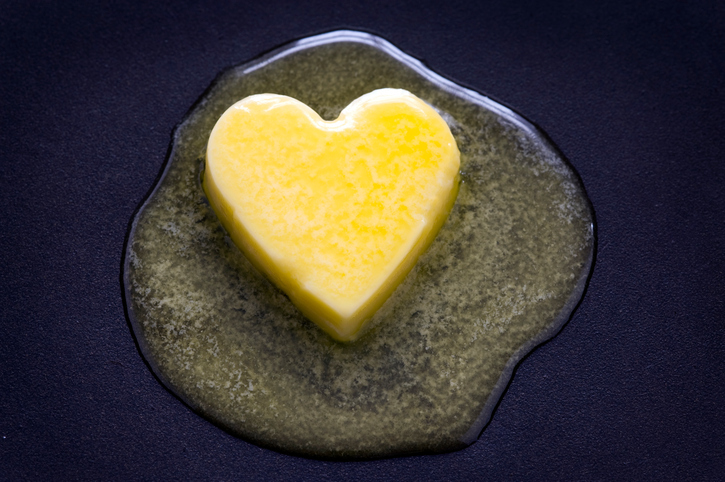 Saturated fats, polyunsaturated fats, trans fats, hydrogenation… what do all these buzz words mean and why are some “bad” and some “good”? At the molecular level, fats are made of a carbon atom chain with attached hydrogen atoms and an acidic end. The order and structure of the hydrogen and carbon atoms is what determines the type of fat we are dealing with. Saturated fat can be identified by a chain of carbon atoms with a single bond between each carbon and the remaining carbon bonds filled (or saturated) with hydrogen. Due to this structure, saturated fats tend to be very straight and can pack together tightly, which is why they are solid at room temperature. Monounsaturated fats are just like saturated fats except for one pair of carbons that share two bonds, or a double bond. Because of this double bond, monounsaturated fats are slightly bent, do not pack together as easily and tend to be liquid at room temperature but solid when refrigerated. Polyunsaturated fats have two or more carbon pairs that share a double bond, and have the most bends and turns in their carbon chains causing them to be liquid even when refrigerated. Hydrogenation is done by forcing hydrogen atoms to attach to the carbon chains of polyunsaturated fats. This makes the oil solid at room temperature, and perform more like a saturated fat. The properties of saturated fats are more desirable for cooking and baking at higher heat and saturated (or hydrogenated) fats tend to be more stable and have a much longer shelf life. Hydrogenating vegetable oils to make them into solids is cheaper than using already solid animal fats. Forcing polyunsaturated fats to become saturated causes some of the bonds to twist, unnaturally, into what’s called a trans fat. All fats have the tendency to turn rancid (decompose). Rancidity happens when the fat becomes oxidized. Why are oxidized/rancid fats a concern? As a fat becomes oxidized free radicals are formed which can destroy other nutrients like vitamin A and vitamin E in foods. These free radicals can also lead to heart disease, inflammation and cancer. As we discussed previously, not all fats are equal in “strength”. Saturated fats have carbon chains saturated with harmless hydrogen atoms which, due to strong single bonds, do not allow other atoms to “steal” bonds. Polyunsaturated fats have carbon chains with multiple, weak double bonds. These fat chains easily allow things like oxygen to come in and “steal” one of the double bonds which leads to oxidation of the fat. High heat, exposure to air, or sitting for long periods are common causes of oxidized fats. Due to the very stable structure of saturated fats, like lard and tallow, rancidity is a low risk making these fats ideal for cooking, baking and long-term storage. Hydrogenation was supposed to help “correct” the unstable properties of polyunsaturated fats, but as we know now, it only made things worse with the formation of trans fats. What are the most common polyunsaturated fats in the American diet? The most common polyunsaturated fats used in the American diet are corn, safflower, canola and soy oils. These oils are highly susceptible to becoming oxidized and creating cancer-causing free radicals. Many of these fats are hydrogenated, which causes the formation of trans fats. Even though we have moved away from hydrogenation, these oils are still very dangerous to our health. The reason why starts with how they are processed. The option of cold pressing oils is an option, but takes a great deal of time and is an expensive process. Instead of using the cold press method, most vegetable oil manufacturers extract oils using petroleum-based solvents. These solvents not only increase our risk of exposure to harmful chemicals, they also remove any antioxidants, that may have existed in the oils. Processing also tends to damage and oxidize the highly unstable oil before it even reaches the grocery store shelf. After the processing of these oils, they are often used to fry things at very high heat, subjecting them to further oxidation. The shelf life of these oils is much shorter than natural saturated fats, but they are usually kept well past this point. Recent FDA laws have required food manufacturers to list the content of trans fats, but this still does not address the still very dangerous nature of processed vegetable oils. Also, restaurants are not required to list the food items that have been hydrogenated, so you have no way of knowing if the foods you are ordering contain trans fats. You can get these fats from a variety of natural, unprocessed sources, including animal fats. None of the naturally occurring fats are made up of only one type of fat, rather they are a mixture of all 3. For example, the practice of calling animal fats “saturated” is very inaccurate. Beef fat is 54% unsaturated, Lard is 60% unsaturated and chicken fat is 70% unsaturated, for example. Polyunsaturated fats have received most of the glory, followed by monounsaturated fats, but saturated fats are very important, if not the most important of the fats. As mentioned earlier, the saturated fats are the most stable and least likely to cause free radicals. Our brain is made up mostly of saturated fats and cholesterol, so a shortage of saturated fats can lead to anxiety and depression among other abnormalities in brain function. Our cell walls are made up of saturated fats. Because of the solid property of saturated fats, they help keep the cell wall firm and strong. When saturated fats are replaced with polyunsaturated fats, our cells are forced to use these in place of saturated fats in the cell wall, causing “floppy” cell walls. These floppy cell walls are less likely to defend the cells from microbes, oxidation and free radicals. Shortage of saturated fats causes skin to sag and wrinkle and be more prone to skin cancers. Fats and cholesterol are required for proper hormone production and functioning. Cholesterol also has healing properties used by the body. Plaque buildup in the arteries is not actually the fault of cholesterol. Cholesterol adheres to the lining of arteries where there is damage and inflammation, to protect and heal the lining. It is things like free radicals, trans fats and biproducts of sugar and processed carbohydrates that cause damage and inflammation to our vascular system. Medium chain triglycerides (MCT) are a type of saturated fat that the body can readily use for energy, increases our metabolism (it takes more energy to process this fat than the energy the fat itself contains) and is rarely stored as fat in the body. MCTs have antimicrobial properties helping fight bacterial, viral and fungal infections. In fact, MCTs can kill off bacteria in the gut that cause IBS and other stomach issues. MCTs are great for anyone with gallbladder disease because they do not require bile, produced by the gallbladder, to be digested. The thyroid needs fat to function properly, and MCTs, in particular, help with thyroid function. A shortage of fat can lead to thyroid disease. Healthy fats found in butter, cream, nuts, meats, eggs, coconuts etc, when consumed in adequate amounts, tell the small intestine and stomach to produce a hormone called Leptin, which alerts your brain that you are full. This creates a feeling of satiety, so you are likely to end up eating less than you would on a low-fat diet. In addition, fat helps keep blood sugar stable, and helps prevent insulin resistance, which causes a huge culprit in weight gain. This article has covered why animal fats are healthy and important in the diet, but there are some exceptions. This is where it is important to do research on where your meat, poultry and dairy products come from. Conventional cattle farming usually involves cattle being kept in tight quarters and feed lots, that tend to be very unsanitary. Cattle are rapidly fattened by being fed grain-based feeds made with a base of soy and corn. Cattle are not genetically made to eat corn and soy, which tend to cause them stomach ulcers and gastrointestinal infections. These infections, in addition to the poor sanitation of their living quarters, requires the cattle to be treated with high amounts of antibiotics. These grains also cause systemic inflammation in animals, which changes the chemical properties of their fat stores to an unhealthy version, that, when eaten tends to cause inflammation in people. Often the grains fed to cattle have pesticides in them, these pesticides in addition to the hormones cows are injected with, tend to remain in their fat stores, therefore, ending up in our food supply. Not only is conventional farming incredibly cruel to animals, it produces unhealthy food. You are what you eat. Grass-fed cattle can move about freely, rotated to different fields for grazing and do not have the unsanitary conditions found with conventional farming. The meat of grass-fed cows provides high-quality protein in addition to many nutrients such as creatine, carnosine, vitamin A, vitamin E, potassium, iron, zinc and phosphorus. The fat of grass-fed cows is also much healthier containing up to five times more omega-3 fatty acids and twice as much conjugated linoleic acid (CLA) as conventionally-fed cows. Eggs from conventionally raised chickens are also much less nutritious, again, due to the conditions in which the chickens are kept. Conventional chicken farming keeps chickens in tiny pens, packed together with little space to move. They are fed grains, also containing corn and soy-base and are in poor sanitary conditions. Eggs from free-range chickens will not contain remnants of antibiotics and hormones given to conventionally farmed chickens. Also, chickens who are free-ranged without antibiotics lay eggs that do not contain salmonella and can be consumed raw. The eggs are also higher in nutrients such as vitamins A, D as well as Docosahexaenoic Acid (DHA), an omega-3 fat that is important for eye and brain health. Organic is not usually enough. Make sure to pick beef, chicken and eggs that are free-range/grass-fed. Finding local small farms that farm this way, is probably the best way to get your meat and dairy products. The main takeaway is to steer clear of any foods that have been greatly influenced, altered or processed by humans. Stick to the most whole, and naturally-occurring sources of foods that you can.